I had an argument with our town webmaster several years back. I was arguing that the prominent phrase "welcome to our progressive town" was unacceptable on an official government web page - even if the citizens were 90% left, and the representatives were 90% left, the town as a whole could not read others out of the body politic. Needless to say, he was incapable of following my point. I had the same reaction to the radio PSAs that are out now, apparently sponsored or at least created by the Dept. of HHS, touting the benefits available to seniors from the Afordable Healthcare Act. Seeing as this is still an item of contreversy before the Supreme Court and a major campaign issue, I think they present themselves as campaign ads, but are paid for by tax monies. I have to disagree unfortunately. While the message might indeed match particular campaigns, I do want to see how the government is trying to be efficient (yeah, yeah, government and efficient in the same sentence). It might need to be a different chart perhaps but it is a step in the right direction. I might cut them some slack, if only because the number of private jobs created dwarfs the number of government jobs lost. Even if one thinks more government jobs is a good thing, it's hard to call a net 80k gain in jobs-at-all "the wrong direction". At least I'd hope that it is. I disagree. As a resident of Florida, I see that the State government is doing all it can to attract business to the State. 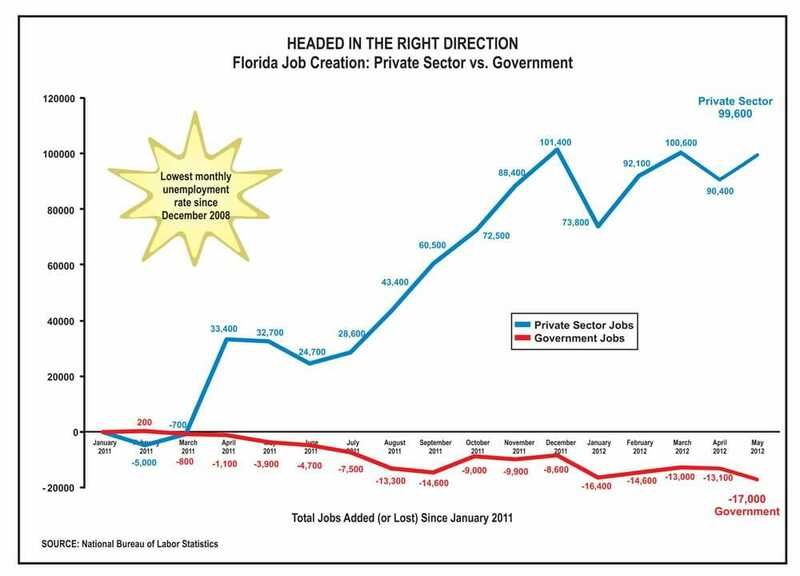 The graph which you find partisan, I see as a healthy advertisement about the economy of Florida. 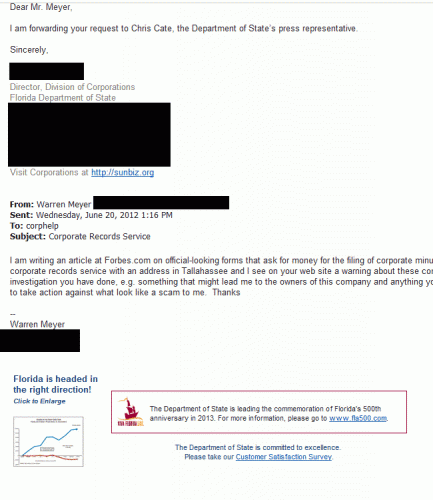 It is appropriate for the Division of Corporations to advertise the attractive business climate of Florida. If that is a partisan statement, shame on the party which takes exception to it. They had their chance to make Florida friendly to business, but in general failed to do so.